Building on the success of the 1st edition, our partner RESCOLL organised a new Technical Day on bonding on 19 June. The event was held at the Cité Mondiale du Vin in Bordeaux and allowed many industrialists to attend conferences dedicated to bonding. 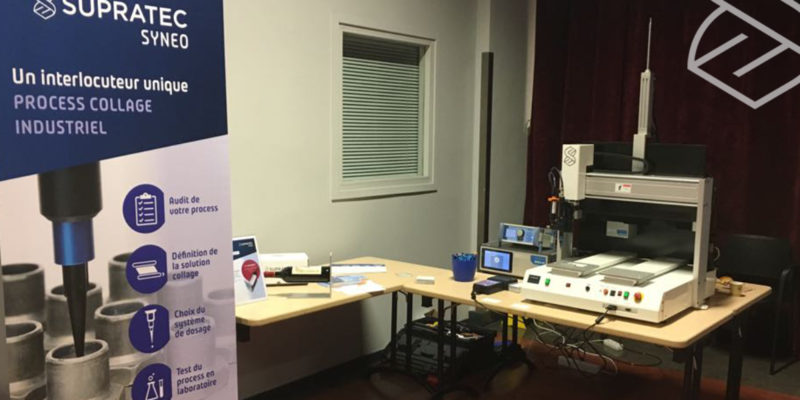 SUPRATEC Syneo teams were invited to present their expertise in industrial bonding processes through the demonstration of an automated dispensing robot. This robot, combined with its Ecopen micro-doser, allows precise application of glue to a defined “circuit” upstream. Once the glue is deposited, the support is moved into a UV chamber, directly integrated within the robot, to allow the glue to polymerise.